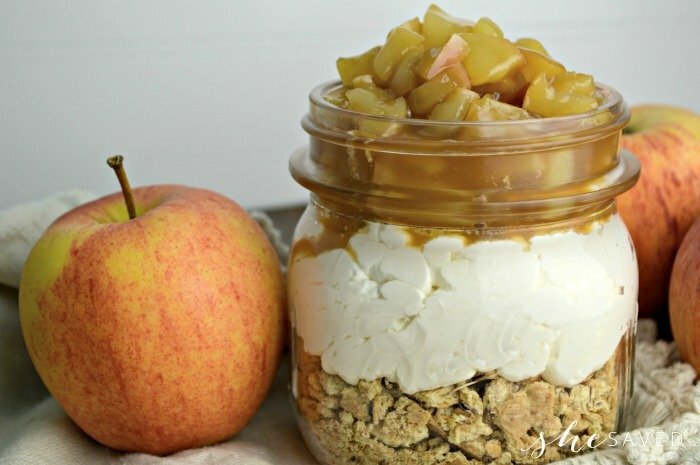 What could be more fun and delicious this autumn than a Caramel Apple Cheesecake recipe that you make in a jar? This apple cheesecake recipe is a new twist on an old favorite or actually, an entirely new way to enjoy both a caramel apple and an apple pie, right? We love the single serving sizes and also the fact that you can make individual portions to serve as many or as few as needed. These are darling desserts for parties too and they will definitely make a fun statement on your party table. 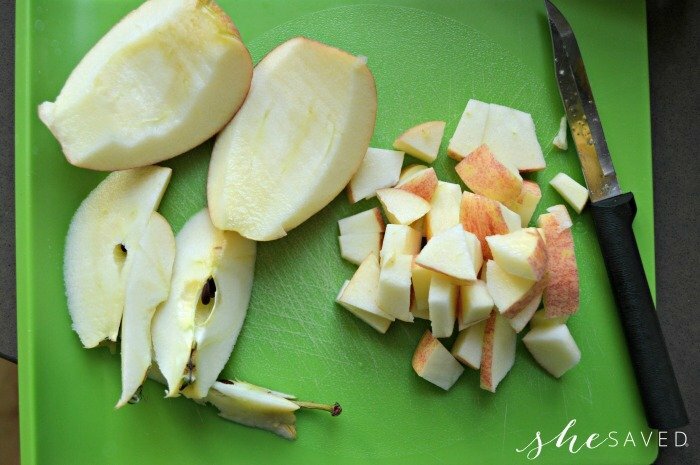 Start by dicing up the apple and removing the core and seeds. Place the pieces of apples in a small frying pan and cook over a low heat with a lid over the pan. Stir occasionally. 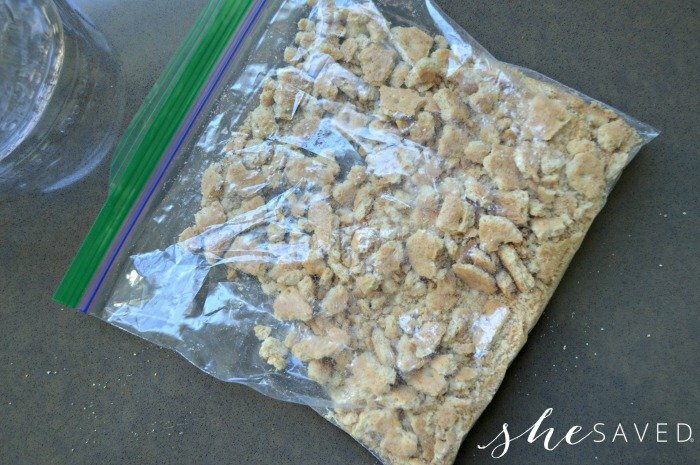 While the apples are cooking, place the graham crackers in a bag and crush them into fine pieces. Put the crumbs in a small bowl and mix with the melted butter. In another bowl, combine the powdered sugar, vanilla, and whipping cream. 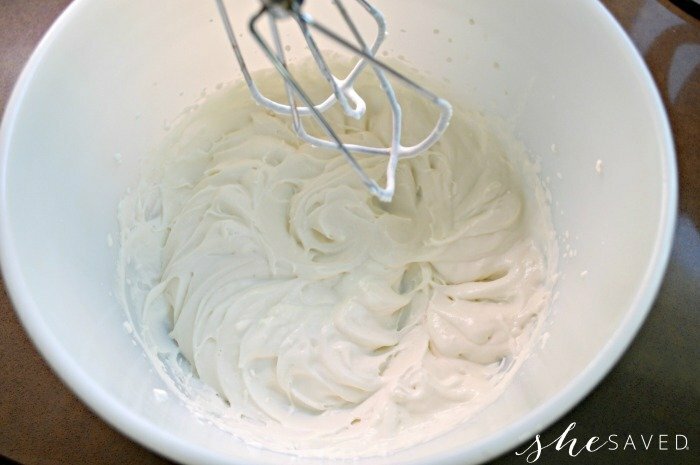 Whip with a hand mixer until the cream forms soft peaks. 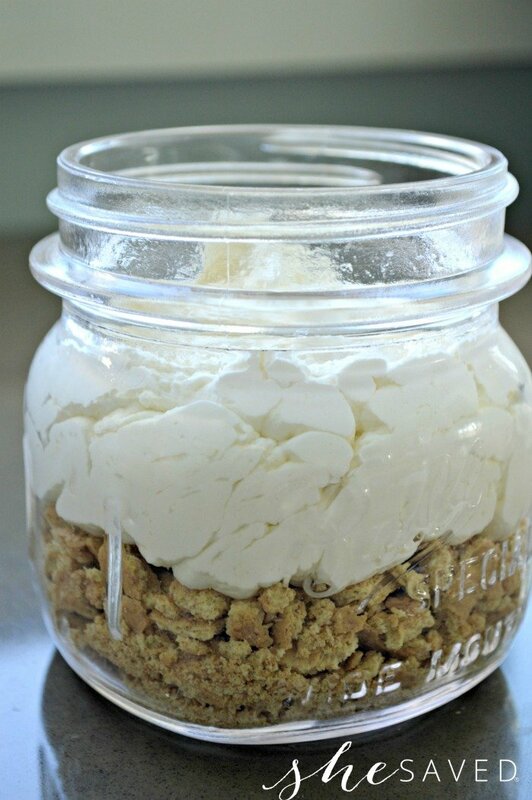 Add in the cream cheese and continue to mix until smooth (softening the cream cheese prior to adding it will help). 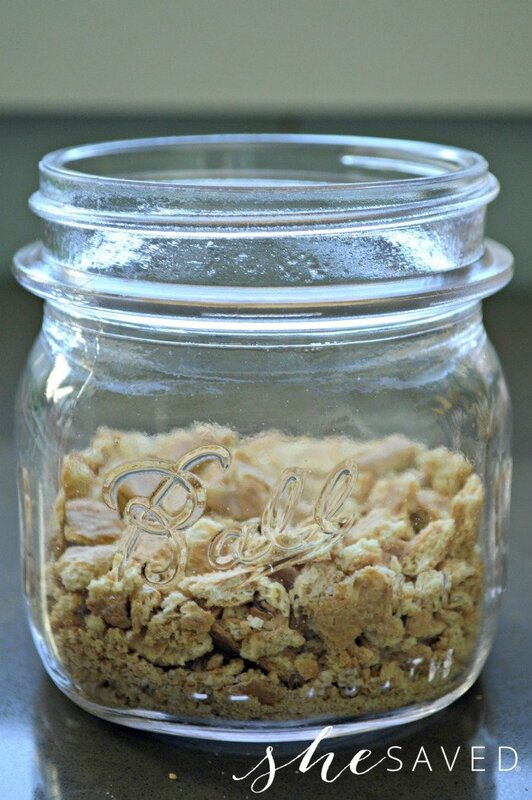 Place the graham cracker crumbs in the bottom of a pint jar. 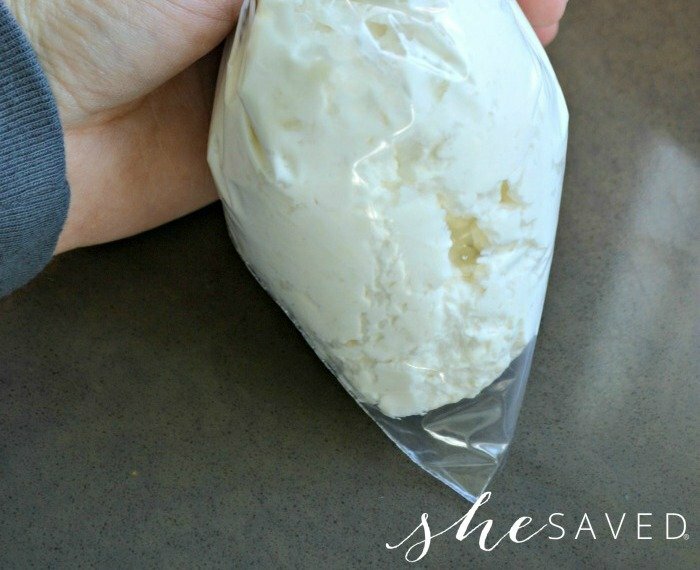 Put the cheesecake mixture into a plastic baggie and cut a hole in one corner. Pipe the mixture into the jar on top of the graham crackers. By this time the apples should be cooked through but not soggy. 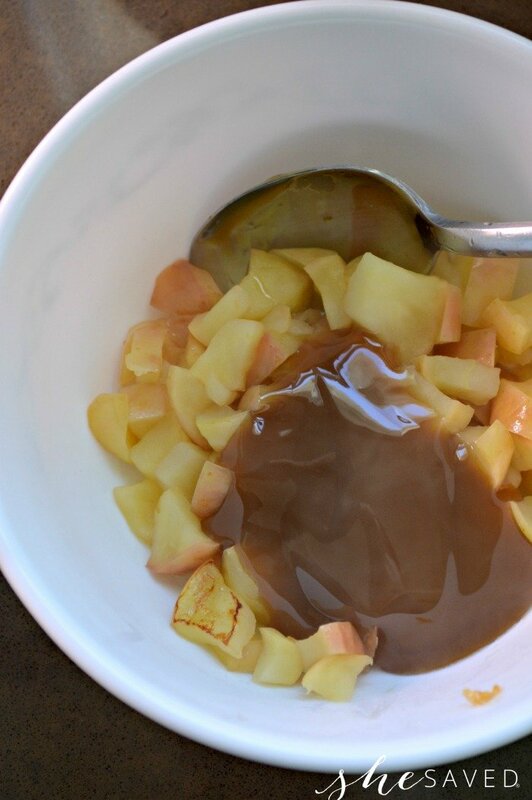 Mix the caramel sauce with the cooked apples. Add the mixture to the top of the jar. You might even consider tying festive ribbon or twine around the outside of the jars to fit with a fall themed gathering. I also love serving jar desserts with these smaller dessert spoons as they are perfect for reaching in the jars and also great for little hands. 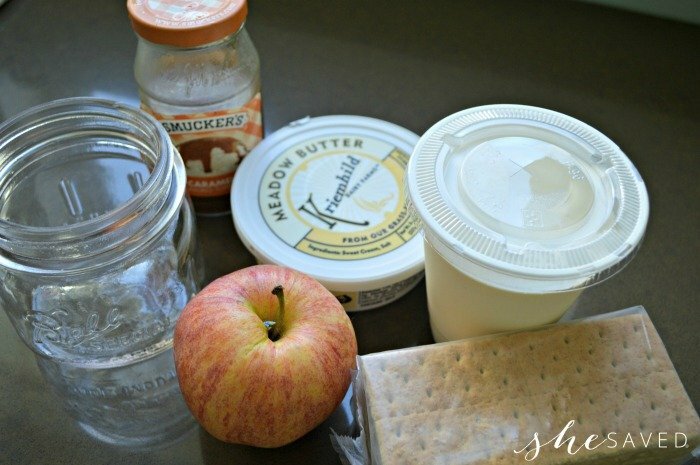 Do you think your family would enjoy this Apple Cheesecake Recipe? Notes: If someone wanted an even easier version of this they could use a canned apple pie filling and whipped cream instead of the cream/vanilla/sugar, however all of the ingredients above do make it taste a little fresher. 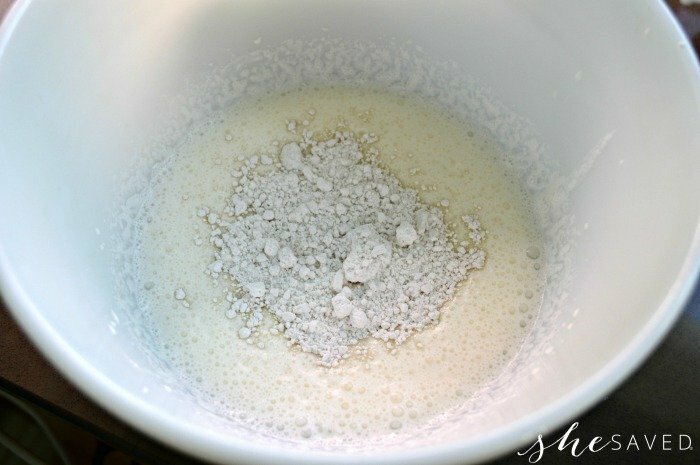 This recipe makes enough for one pint jar so it wold need to be doubled/tripled/quadrupled to make more OR you could fit this recipe into 2 jelly size jars for a mini dessert. This looks so delicious. I can see making this when my grandchildren visit the next time. However, I do have one question. Is putting the ingredients in this small of a jar for the picture impact only? Because I do not see how it can be eaten this way. At least to experience the flavors and textures of the crumbs, cream cheese mixture and apple mixture. This looks like a 4 oz jar. I'd put it into a pint or jelly jar. Especially if I was making 3 or 4 of them for my grandkids to eat. And hey...not just them. I think my friends would enjoy sitting around the kitchen table chompin' on this! ha ha! But I do appreciate such a wonderful recipe. Especially here in the Fall, with apples in abundance right now. Thanks for the recipe! This looks soo delicious... I think I drooled after seeing that very first picture! Featuring you at The Creative Corner tomorrow! Thanks for sharing! What a great idea. Looks amazing. Thank you for linking up with us at #HomeMattersParty .See you again next week. 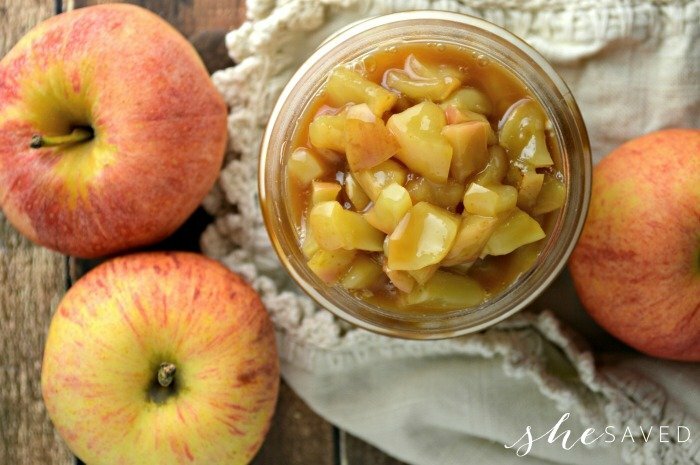 I am definitely a caramel apple loving girl and this looks great! Sharing on my FB page this weekend! Thanks for sharing with us at Merry Monday. Can't wait to see what you're making next! These look scrumptious! I love apple desserts in the fall. Thanks for linking up with Merry Monday this week - I'll be featuring your cheesecakes at our upcoming party. This looks delicious! 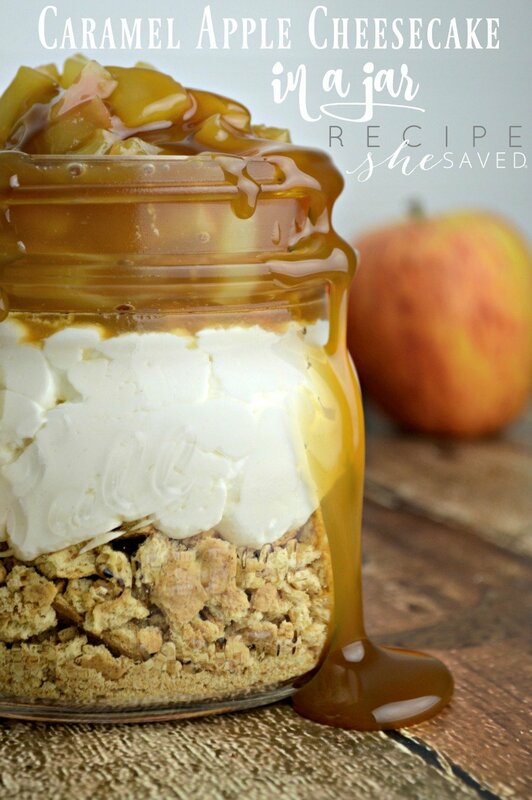 I love the caramel flowing over the jar :). Thank you Kristin, I'm thrilled to be a part of your party! !